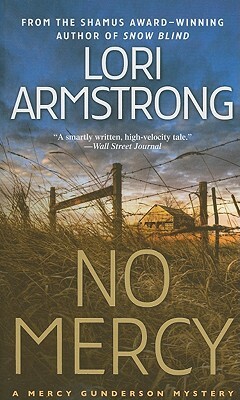 No Mercy is the first book in Lori Armstrong’s new Mercy Gunderson series, which is currently three deep and growing in volumes as well as popularity. Mercy is a Jack Reacher kind of character in the kind of territory Walt Longmire would feel at home in. In fact, Longmire’s creator Craig Johnson had some very nice things to say about the book and the author. Lori Armstrong is a new writer to me, which is a good way to start out the new year, but I’ve been aware of her name on romance novels. I knew going into No Mercy that I would probably encounter a romantic subplot, and there is one, but it doesn’t overshadow the story, kind of gives it a bite, actually. I love Mercy’s character and the military/sniper background she has. I see lots of action potential in her, but it’s the kind of stuff that works. She’s a hero, but not a superhero. When a bigger guy goes up against her, she doesn’t miraculously beat him with ninja powers. Mercy knows her limitations and chooses her fights when she can, and she fights to win, not necessarily be fair. She’s also in her late thirties, a woman who has seen twenty years of military combat and has the scars to show for it – physically and emotionally. The author’s gun knowledge and familiarity with military nomenclature is evident, but not overpowering. I also liked the fact that Mercy doesn’t rely solely on weapons, but on keeping in shape and knowing what she’s headed into. This isn’t some babe in the woods the big bad wolves are going to easily get. I do have to admit that Mercy’s bad luck with family strained credulity. I know people in the real world have horror stories to tell too, but this book really socks it to you again and again, till I felt a little put upon to believe everything. Still, Armstrong moves her story along at a snappy pace. The mystery holds together, though some of the suspects kind of fade out at times. There are enough twists and turns here to satisfy the mystery reader as well as the thriller fan. I especially loved the author’s presentation of South Dakota. I have been through the area and it’s dead on the mark. Her people are real to me because I have known people like them. It was a pleasure getting to know Mercy, and I’ve already got the sequels. This entry was posted on January 7, 2013 at 1:22 pm and filed under Audiobook,Crime,Mystery,series fiction,Thriller. You can follow any responses to this entry through the RSS feed. You can leave a response, or trackback from your own site. « A Plug For the Rancho Diablo Series!